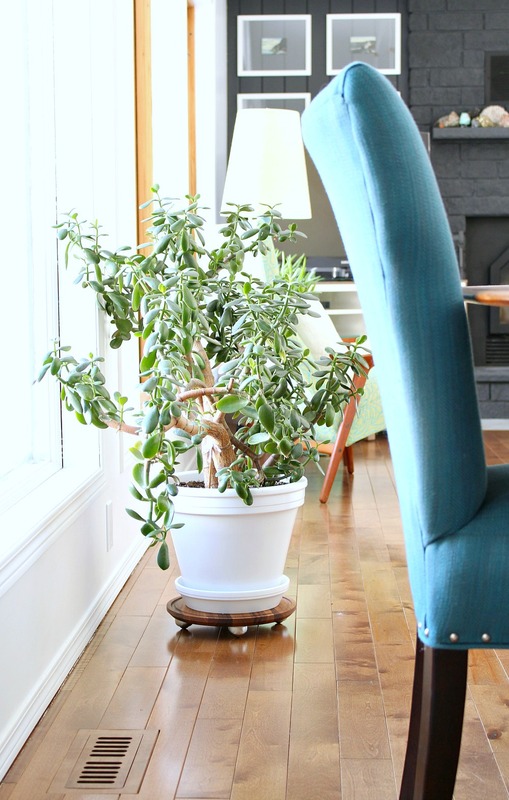 I am so excited to share today’s two minute home decor project with you: a gorgeous, modern, DIY plant dolly. Before I show you how I made it, please feel free to congratulate me on keeping this massive jade plant alive for the past year and a half. It’s a little dusty, but growing! Hello little leaves. Everyone says jade plants are easy to maintain, but I’ve killed one before (after many good years together), so every day that this guy looks green and happy is a victory for me. He seems to be enjoying his spot in the lakehouse, although he and Szuka do fight for window space. Whenever I move him to wash the floors, she immediately settles into his spot, staking her claim on the whole wall of windows. I don’t move him often, though, because he weighs a TON. His relatively stationary life has made him grow a little kitty womper, because I don’t rotate him enough. Looking for an easy way to move this massive plant, I started looking into plant dollies but I couldn’t find a cute one to buy, so I abandoned the search. 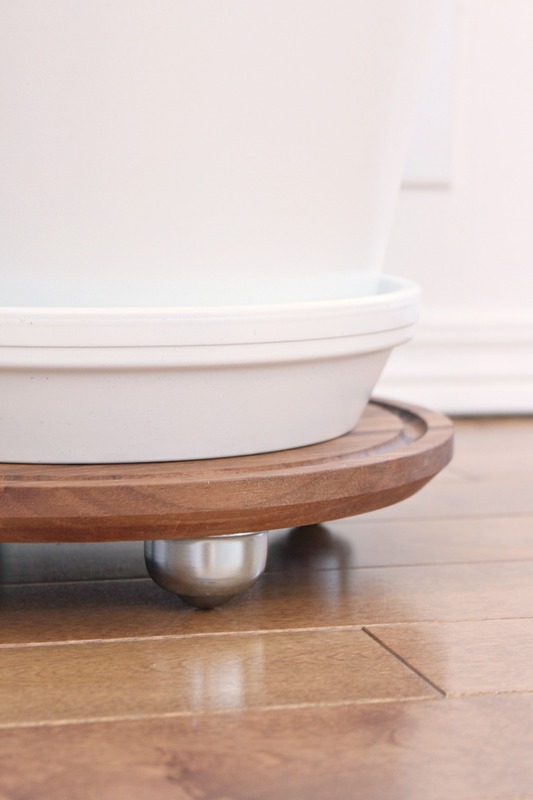 While shopping online for supplies for a different project, I stumbled across nice low profile castors and decided that a DIY walnut plant dolly might just be the easiest thing to make! To make life easier (we loathe cutting circles), I bought a solid walnut wood cutting board. I ordered mine online and it was kind of expensive, but I always see inexpensive ones at places like Home Goods and HomeSense. A less expensive wood, like bamboo, will only cost around $10 and acacia is in the middle (around $30). I just love me some walnut. For size, I recommend choosing a cutting board that has a diameter 2 to 4 inches larger than the base of your flower pot. For thickness, I went with 3/4″ and for strength I don’t recommend any thinner, but thicker would work too. I also chose one with a juice drip groove just in case but I doubt I’ll ever need it because I’ve never over-watered the plant before. The next step was painfully easy: just place the castors equally spaced out, about an 1/8″ from the edge of the cutting board. The wider the castors are placed, the more stable the dolly will be, so I inset them just enough so they can’t be seen from the top. Mark where the screw holes are once the castors are positioned. Remove the castors and pre-drill the holes. Put the castors back in place and screw them in. Just make sure you don’t screw to the other side (you can use a piece of tape on your drill as a poor man’s depth guide, that’s what I do). That’s IT! 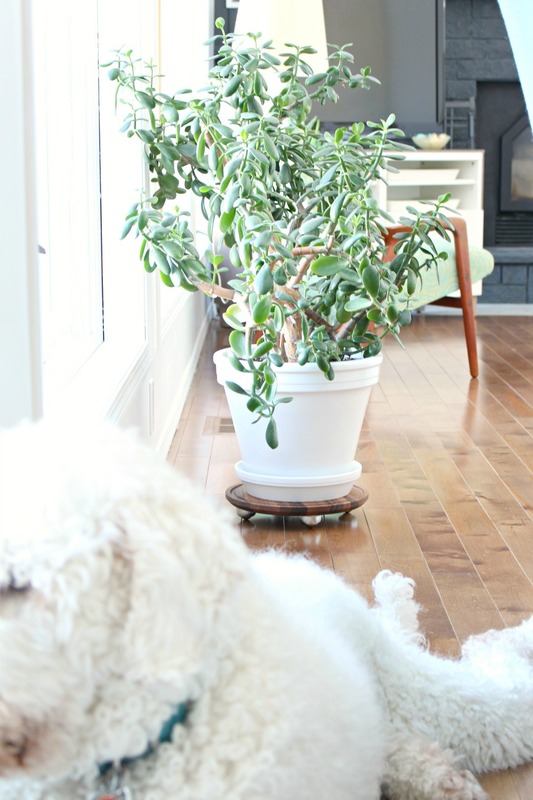 That’s how easy it is to make this DIY plant dolly! I am obsessed with how cute this DIY plant dolly looks! The walnut really blends in nicely with our floors and these castors glide so smoothly. 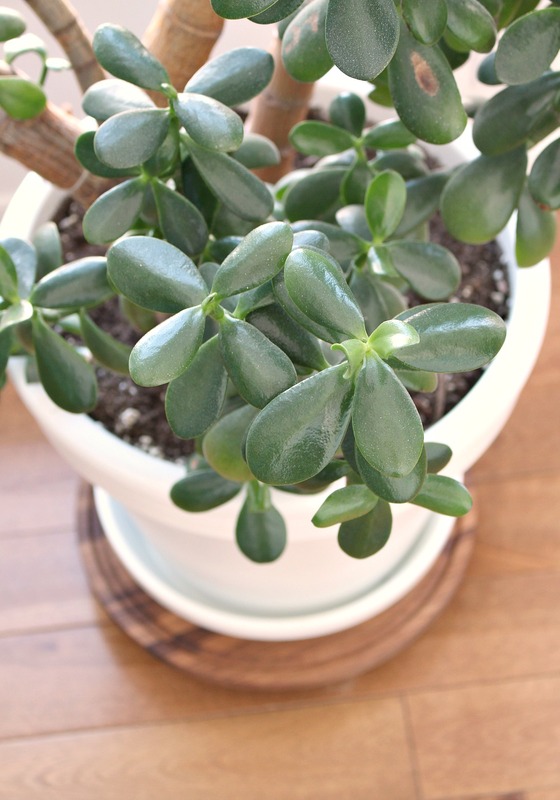 Because the jade plant is so heavy, it’s still really stable, so it’s not like a little nudge sends it scooting across the room. We need to purposefully move it, which is good. A lighter plant might go skittering across the floor when brushed against, with such smooth castors. No problems with Szuka knocking it over because she realized one Day One that the jade plant now moves, so she’s been really gentle around it (it’s kind of adorable.) 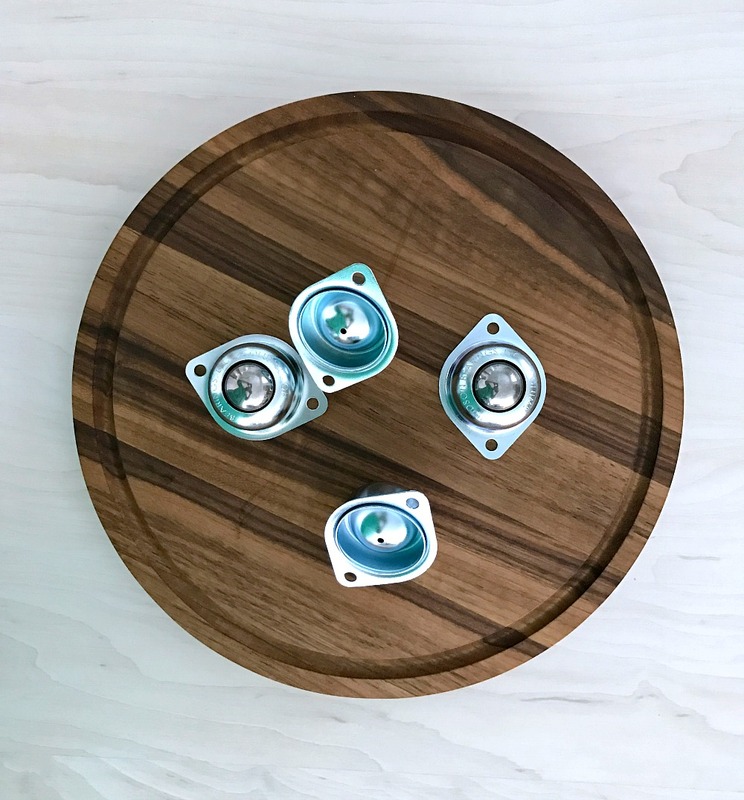 If you have some overzealous pups or kitties, castors that lock (like these cuties) might be a good investment – and maybe even a super shallow wood bowl or a cutting board with a lip might be a good idea for the dolly. If you make your own DIY plant dolly, I’d love to see! P.S. 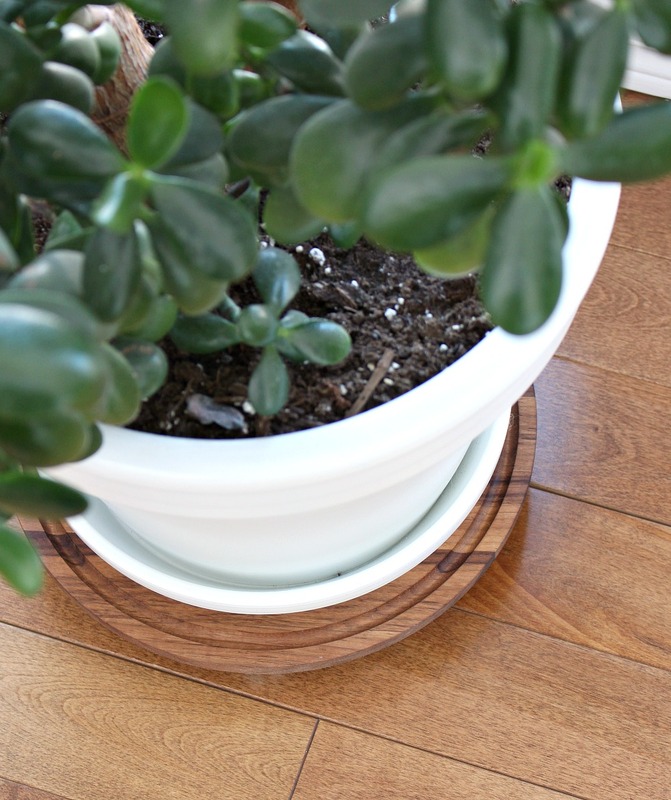 That white planter was a DIY project too – and it’s holding up perfectly. So happy this idea is useful!! That's brilliant! I have a huge ficus tree that needs this, thank you Tanya! When we lived in California I always has a Jade plant. My Mother-in-law called it a money plant, as long as you had one growing you'd have money. I've killed 2 since we've lived here in Georgia, not sure what I do to them. Love the plant stand. A cutting board – nice find! I have struggled with Jade plants in the past, but I've got one going strong for 2 years now. I think the key is to sort of just ignore it. Haha, everybody is happy! The perfect DIY. My back is happy too – this jade is heavy!! 10 was odd but I needed eight ultimately and figured two spare was good because things are made so cheaply these days. Love the idea of underbed storage – that's clever! Easy indeed! I'm doing this for two plants I have here, thanks for sharing the idea! I'm so happy people have found this idea helpful!